Prior to my 2015 internship at Rocky Mountain Institute (RMI), I had preconceived thoughts on the activities and effectiveness of think tanks. Perhaps more than I should admit, I had the image of a group of smart people contemplating some of the most daunting problems of our day. In my mind’s eye, those thinkers were largely isolated from the world where those problems lived. It is with this mindset, that I entered the Transportation practice at RMI where I hoped to gain a better sense of the space think tanks occupy in a world of markets, politics, communities, and the environment. What follows are observations on that role, within the specific context of RMI. The space between technology and business is sometimes more cavernous than technophiles would tend to expect (or desire). Whether it’s institutional inertia or lack of information or an expectation that consumers will adhere too closely to their status quo bias, even smart strategic innovations can simply be overlooked. Fortunately, think tanks are often funded specifically to bring good ideas to market faster. For example, RMI’s Business Renewables Center (BRC) was established to take existing off-site renewable energy technology and accelerate adoption by corporate partners, many of which already have clean energy goals. 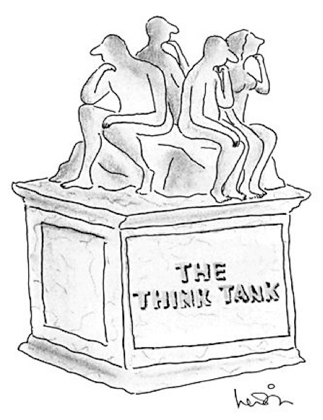 Think tanks are seen as trusted advisors. They can be resources and consultants at many different levels of government to help convey the science that underlies decision-making. Further, government representatives have utilized think tanks in the development of economic plans supporting initiatives to achieve specific objectives (e.g. a “clean, prosperous, and secure energy future” in the case of RMI). Citizens can also utilize think tanks as reliable interpreters of information from academia, government, or the private sector. For example, RMI’s Devi Glick (SNRE/SPP ‘12) put together this synopsis of President Obama’s Clean Power Plan. When a group of some of the world’s experts collaborate together on solving difficult problems, it’s perhaps no surprise that innovative for-profit businesses ideas sometimes emerge. RMI’s work on lightweighting automobiles in the early 2000s spun off into Hypercar Inc, which then turned to manufacturing and broadened its scope to become Fiberforge Corporation. The usefulness of think tanks in the world of business is often tied to the fact that so many members of the organization come from outside the world of research. It’s quite powerful when ex-corporate executives, engineers, etc. are suddenly able to unabashedly explore whole systems solutions without being constrained by siloed corporate structure. Whether opening up a process of collaboration with a corporate partner or simply providing insight from internal collaboration, think tanks can adjust paradigms that benefit corporations and even full industries.